There are three users in my XP setup: "Administrator," "Me" (with admin rights), and "Guest" (with minimal rights). If Guest boots the computer, I want to prevent Ghost from starting, since I don't want Guest to fiddle with it. This is probably some security function of Windows XP, but I can find no instructions on how to do it. Re: Windows XP Home: How do I prevent Ghost 14 from booting when a non-administrator boots up? I think Ghost will still run, but you can limit what the guest can do. 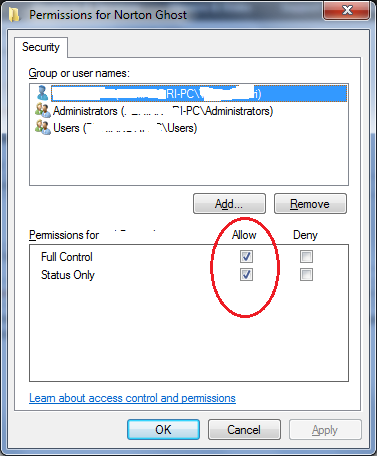 Using an administrator account click Start>Norton Ghost>Security Configuration Tool. Then set the permissions the way you want. I think the tray icon is a global setting in the registry.. I suppose you could move that entry to your administrative accounts registry key or just put a link to Program Files\Norton Ghost\Agent\VProTray.exe in your startup folder.